Sounds delicious right? 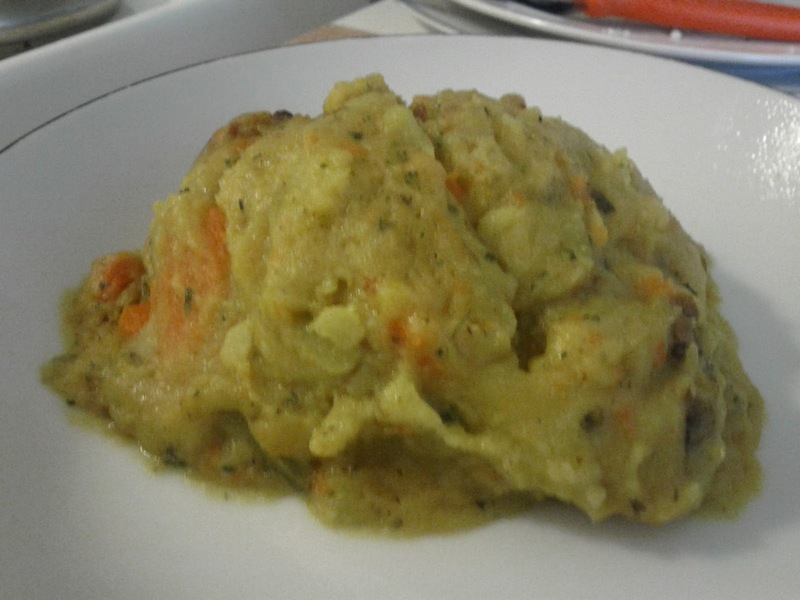 I like food that comes all mashed together and can be served as an amorphous blob. This particular blob tasted great! How could it not with bacon, cheese, lots of butter, and a few lighter Indian flavours. Who are we kidding, it's just mashed potatoes with a few veggie friends on a road trip. 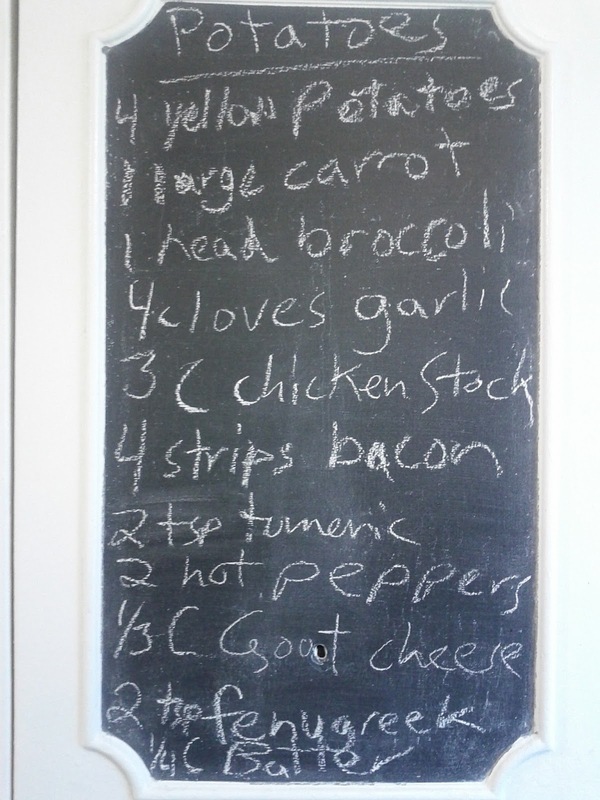 If you are in the mood for a tasty mess (even my chalk board writing looks extra messy today), start by boiling the potatoes, broccoli stems and carrots in chicken stock. After ten minutes, add the broccoli tips and boil for another ten minutes until everything is soft. Meanwhile, fry some bacon in a skillet. 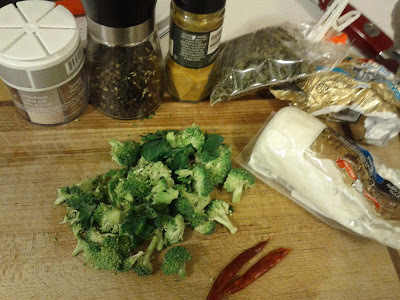 When it starts to turn brown, add garlic, tumeric, hot peppers, and a bit of the chicken stock from the boiling pot. Simmer for 2 minutes and add butter, fenugreek and goat cheese. Stir to melt everything together. Add more chicken stock if needed as by this time the potatoes should be soft. Drain and mash the boiled things and add the contents of the skillet. Mash some more until you like the consistency. 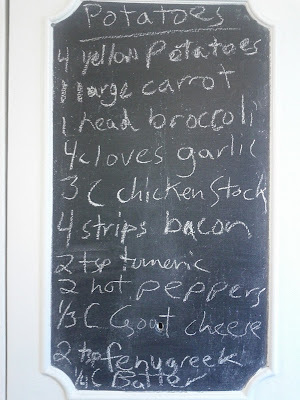 I like it with a few vegetable lumps. Eat up! Boil these first. 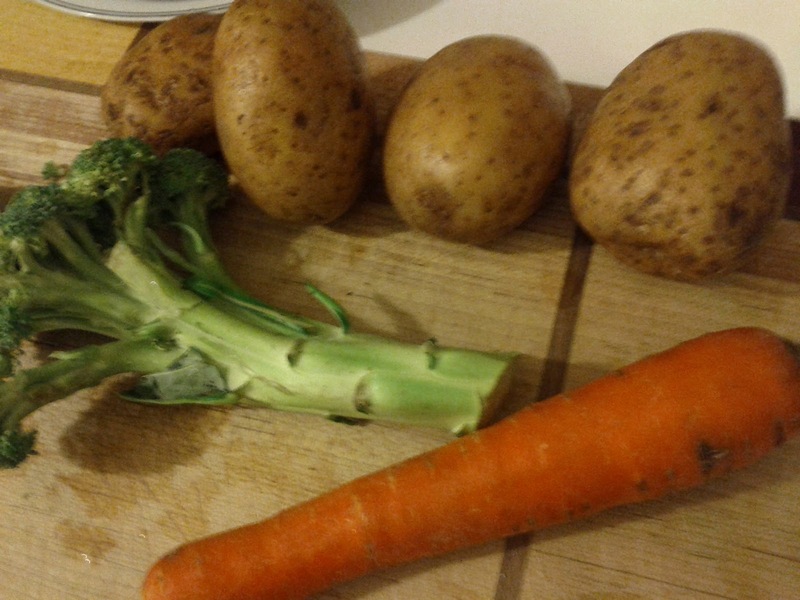 I peeled the carrot and broccoli stem but not the potatoes. It's probably a good idea to cut them up a bit first. Add these things later. I didn't quite use all of the goat cheese. Tasty goo on a plate. The turmeric makes it a lovely yellow colour and is extremely good for you. A great level of spice. Nice chewy bacon pieces. Intensely flavourful. If there are leftovers they would be good formed into a large patty and fried so the outside is crispy and the inside soft. Makes me hungry just thinking about that. That would have been really good! I think the Britons call that bubblensqueak or somesuch. It didn't last long.